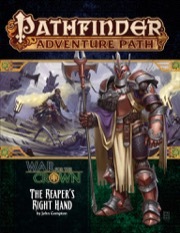 "The Reaper's Right Hand" is sanctioned for use in Pathfinder Society Organized Play. The rules for running this Adventure Path and Chronicle sheet are available as a free download (922 kb zip/PDF). I wanted to enjoy this adventure, but I have to say I was disappointed by this issue. While it did have some pretty cool parts, especially the bestiary, and other aspects, such as the writing or the Thamir Gixx article were solid if not impressive, this adventure fell flat for me conceptually. The dungeon in Part 3 had a solid mix of enemies, and an interesting moral dilemma, but the big bad seemed absentminded. Overall, I couldn't enjoy the dungeon when I couldn't get behind why I was there in the first place. I was largely disappointed because the campaign that seemed aimed at civil war, and a contest between people, devolved into another generic 5th module trip to the planes, one that you are punished for in the conclusion of the module. This is a delightful adventure. It's whimsical without being absurd, has quirky and memorable characters, and some great roleplaying opportunities. The villains are no slouches either. 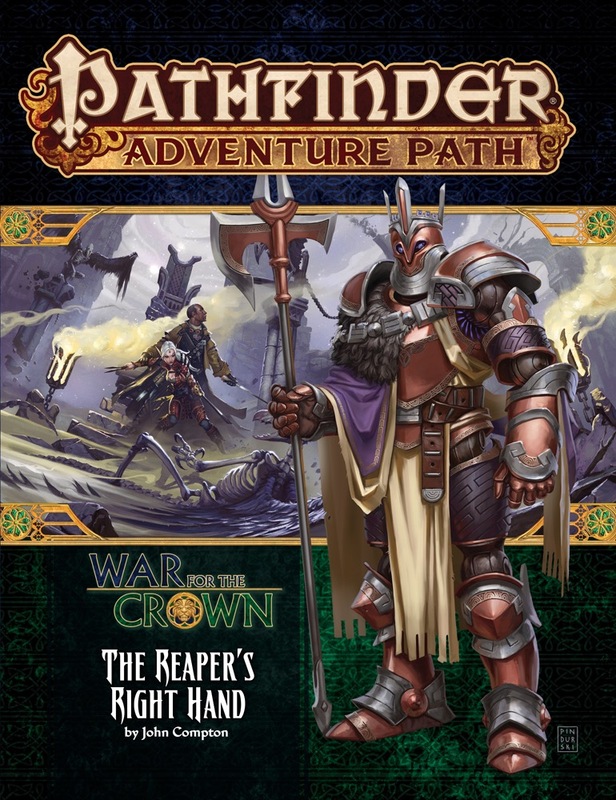 What I most enjoyed about Reaper's Right Hand though, is that it grants a welcome reprieve from what has been a fairly tense and serious adventure path. It does not, however, do so at the expense of the War for the Crown AP as a whole. Sure your PCs might be running against a medusa for a political position, or convincing a hivemind cockatiel swarm to give back a ring, but these goals still serve to forward the story. The whimsy ends - mostly - in the third act, however, when the PCs must storm a classic dungeon. I was worried that an adventure set in the lawfully-aligned plane of Axis would be sterile and boring, but this is not the case at all. To be honest, this adventure felt like it could fit as easily in the chaotic realm of the First World with a few tweeks. The corner of Axis where Right Hand takes place has its eccentricities to be sure, but there are still reminders that this is the plane of ultimate law. An active police force, inevitable guardians, and even a bit of bureaucratic red tape keep things from becoming too out there. The supplemental articles on Sayashto (the city where the adventure takes place) and the halfling assassin god Thamir Gixx were fine and accomplished everything they needed too. I wasn't blown away, but that's a small quibble. I was a little disappointment with the bestiary section, mostly because none of the monsters really "popped" for me. Again though, these small issues do nothing to detract from the high quality of the adventure itself. A nice foray into the plane of Law, Axis, as well as the realm of a deity. Combat and creatures were varied (not just outsiders - a couple of which that were not expected). As with most of this adventure path, there was a good balance between social mechanics and combat encounters. The article about Thamir Gixx was interesting (always great to have some of the nonhuman pantheons given some love). Would have liked to have Gixx's domains listed for quick reference, as well as special servitors and his herald. Now that's a twist I did not expect. Oh, MAD politics in a Pathfinder adventure. I just knew this AP would find all kinds of ways to BLOW ME AWAY! Hope Milani being on the early cover of this actually means she or her followers actually show up in a big way. Milani's home realm is in Axis after all. Wow, planar adventure in non mythic ap? ._. Is this first bigger non cameo planar visit in AP? Legacy of Fire and Kingmaker both have one virtually 100% planar adventures. Strange Aeons and Hell's Rebels both have adventures that are 50% planar. Ironfang Invasion finale is largely planar, too. That's just off the top of my head. At some point there were even people complaining that dropping a demiplane or a pocket dimension in every AP gets long in the tooth. Planning this Adventure Path as a whole was absolutely a blast, and our coming up with this development was one of the delightful twists that we've been keeping quiet for months now. I'm very excited to be writing it. I noticed this and the sixth book of Dead Suns doesn't list the extras included. Also, by slip their mortal bonds, does that mean they're going to die. Axis! Yay! Planer stuff is always welcome and between this, psychopomps, and general soul shenanigans in a couple of adventures, War for the Crown is starting to look pretty Planescapey. Sooooo... are we going to get. Deity on Thamir Gixx in this one? Because that would be awesome! I assume so but I could be wrong. Whoa! the PCs get to meet Taldaris? ... I'm just glad you were able to parse what I posted. My grammar's not great at the best of times, but that looks like my brain jumped out of my head. Far less exciting than meeting Taldogis. A servitor creature of his is in the first installments' bestiary, so maybe! But yeah cheers for Axis! That's exactly what clued me in (and the line about a certain halfling reappearing in this instalment)! Mostly I like what I think is a Marut or some kind of Inevitable on the cover. The major noble lines of Taldor? With heraldry, perhaps? I only wish for more on inevitables. ;) But that's cool too. Looking forward to Gixx - not often we get info on the nonhuman deities other than Calistria and Torag. If it's one of the planar true dragons, I hope it's illustrated by the same artist. You're probably going to like Faiths of Golarion, with a tengu and a gnome deity already confirmed. I have to say that while edict dragon sounds like the name of a planar dragon breed, and it indeed comes from another plane, I am a bit sceptical about a true dragon in an AP, even more with it breaking the 5 dragons per "scept" tradition. I'm hoping for it to be Axis' planar dragon, and that we are luck enough to get the Abbadom and Nirvana dragons in our way to PF2E. Well magnuskn, seeing as you already have the PDF, mind giving us a peek at the bestiary? ( i.e. the names of each monster, their CR, and monster type) Thanks in advance. Thanks Zaister! So the Edict Dragon really is a honest-to-Abadar true planar Dragon? Sing a song of Silver, this AP has the best Bestiary section since Rasputin Must Die! What does the edict dragon look like, if you don't mind me asking, and what's the coolest thing it can do? It has a coppery body color and grey wings with blue runes on them (which are, in fact, a single Symbol spell on each wing). The breath attack is a line which deals slashing damage and, if you fail the save, affects you with a Command spell. Very nice. Got anything on the Radiant Essence? I don't think we've ever had a good ooze before. They're the collected essence of several good outsiders whose spirits merged into a Radiant Essence due to their collective zeal to continue to do good. It's still unintelligent, though, but has automatic Detect Evil and its attacks count as good-aligned. Thank you magnuskn. Mind telling us what tasks each of the inventables was manufactured for, and what they look like? Impariut: Encourage responsible governance, otherwise intervene. It's a metallic looking bald heavily muscled dude in robes and a longsword. Thanks magnuskn. Hykariut sound like they'd be a fun addition to a Hell's Rebels game, or maybe a good high level ally for a Galt campaign if you're aiming to end the unending revolution. I can't imagine the likes of Barzillai or Ileosa taking very kindly to Impariut, though. What is an Axial Monitor, anyway? They are tasked with preventing disturbances to order and investigating crimes in the city of Axis. Any particular reason for this specific curiosity?